Directed by Prashanth Neel, KGF also stars Srinidhi Shetty in a lead role besides Yash. 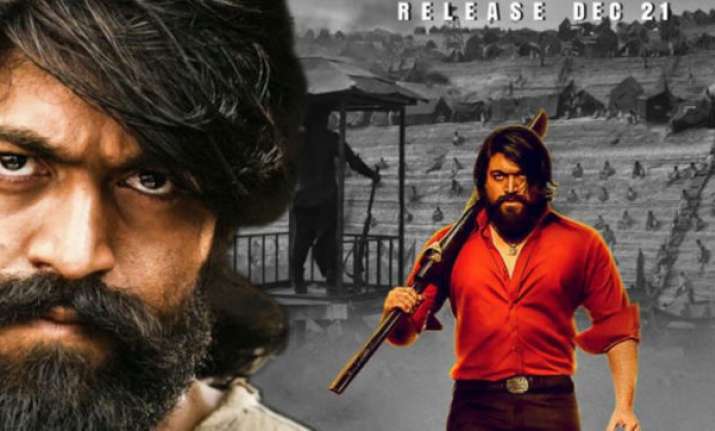 Yash starrer KGF has done excellent business in the opening weekend as it runs riot in Karnataka. The weekend collections in the state are only second to Bahubali - The Conclusion. It has also done well in Mumbai and Nizam / Andhra. The collections in Tamil Nadu and Kerala are low. The Hindi version has done decent business over the first weekend thanks to good busines in Mumbai circuit and CP Berar. The trend is also good with solid growth on weekends and Monday. Trade analyst Taran Adarsh said, "#KGF continues to trend very, very well... Mon is higher than Fri and similar to Sat... #Christmas holiday today should boost its biz further... Fri 2.10 cr, Sat 3 cr, Sun 4.10 cr, Mon 2.90 cr. Total: ₹ 12.10 cr. India biz. Note: HINDI version". KGF held up very strongly on Monday as it collected 13.75 crore nett on day four across India compared to the 16.50 crore nett on day one. The drop is under 20% and the drop is only in Karnataka where the film had a huge opening, states Box Office India. According to Box Office India, the Hindi version has jumped around 45% from the first day which is a very strong trend especially for this type of film. It is trending like a HIT Hindi content film when it is actually a South action film that too from Kannada film industry which actually have no hope in the Hindi markets. Its not done well across all Hindi markets but whatever it has done still ranges from good to decent because in some parts its near impossible to get the audience in for this type of film. The first instalment of the two-part series, released in about 2000 screens across the globe on December 21. The opening weekend seems to have cemented KGF as one of the strongest contenders at the box office alongside Shah Rukh Khan's Zero and Dhanush's Maari 2. In four days, KGF has collected Rs 41.7 crore in South India alone. Apart from Karnataka, the film is doing extremely well in Andhra Pradesh, Telangana and Tamil Nadu as well. From the remaining part of the country, KGF has minted over Rs 15 crore in four days of its theatrical run. In addition, the film has attracted the audience in the US and it is said to have grossed nearly Rs 5 crore.